Just over a week ago, on 7th November the sunny Florida airport of Miami International said a cheery hello to its first weekly flight by Etihad Cargo – which is, as the name clearly suggests is the cargo division of Five-Star-rated Etihad Airways, the national airline of the United Arab Emirates. These new scheduled freighter flights are being operated on the carriers vast Boeing 777-200F aircraft, make a stop in Columbus, Ohio before continuing to Miami, Amsterdam and Abu Dhabi. The route launch makes Miami the airline's third U.S. cargo route and fourth in the Western Hemisphere, joining Columbus, Tucson and Bogota. Etihad Cargo's entry into the Miami market now also gives MIA two all-cargo routes in the surging Middle East region. "We proudly welcome Etihad Cargo to Miami-Dade County," said Miami-Dade County Mayor Carlos A. Giménez. "Their addition to the local cargo industry brings new revenue and job creation to our community, which is already home to the busiest international freight airport in America." Etihad Airways is the fourth carrier to launch all-cargo service at MIA this year. In February, Qatar Airways launched two weekly cargo flights from Doha and Miami, with stops in South America and Europe; Mexico-based Aeronaves TSM commenced 10 weekly flights from Cancun in March; and TACA Peru began four weekly freighter flights from five South American cities in August. "Congratulations to Etihad Cargo on their successful launch at MIA, which will further increase our trade with both Europe and the Middle East," said Miami-Dade Aviation Director Emilio T. González. "Their new route is yet another significant milestone in our strategic plan to expand into untapped regions of the world." David Kerr, Etihad Cargo Senior Vice President, said: "We are pleased to offer main-deck capacity on this burgeoning trade route for businesses from Miami-Dade County and beyond to the Middle East. 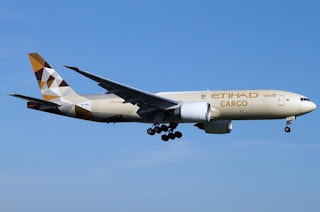 Miami International Airport, with its excellent connections to South America and its modern infrastructure, is an ideal destination for Etihad Cargo." Established in 2004, Etihad Cargo complements the belly-hold capacity of Etihad Airways' 100-aircraft passenger fleet with 10 all-cargo aircraft that fly scheduled service to Europe, North and South America, Asia, Australia, the Middle East, the Indian Subcontinent and Africa. Etihad Cargo was voted Cargo Airline of the Year at the Air Cargo Week World Air Cargo Awards in 2017 and 2016. Miami International Airport offers more flights to Latin America and the Caribbean than any other U.S. airport, is America's second-busiest airport for international passengers, boasts a lineup of more than 100 air carriers and is the top U.S. airport for international freight. MIA, along with its general aviation airports, is also the leading economic engine for Miami-Dade County and the state of Florida, generating business revenue of $33.7 billion annually and welcoming 70 percent of all international visitors to Florida. MIA's vision is to grow from a recognized hemispheric hub to a global airport of choice that offers customers a world-class experience and an expanded route network with direct passenger and cargo access to all world regions. MIA is committed to sustainable practices. Learn more at www.MIAefficiency.com.